Angstbedingte, depressive und somatoforme Störungen (ADSom) kommen in der hausärztlichen Versorgung häufig vor. Zur gezielten Unterstützung von Patienten mit diesen Störungen erprobt die SMADS-Studie eine komplexe, niedrigschwellige Intervention zur Selbstmanagementförderung (SMF) durch speziell geschulte Pflegekräfte. In dieser Arbeit wird untersucht, wie die Veränderungsmotivation der Patienten vor Beginn der Intervention mit der primären Zielgröße Selbstwirksamkeit zusammenhängt, um zu erfahren, ob die SMF die geeignete Patientengruppe erreicht. Anxiety, depressive and somatoform disorders are highly prevalent in primary care. Managing these disorders is time-consuming and requires strong commitment on behalf of the general practitioners (GPs). Furthermore, the resources for the management of these patients are limited by the increasing workload in primary care practices, especially in the German health care system. 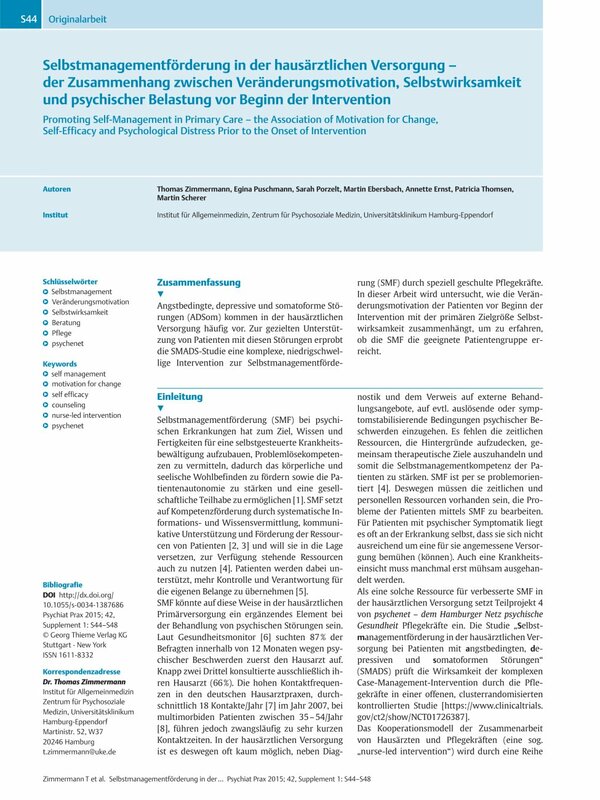 In order to address the SMADS-study within psychenet – the Hamburg Network for Mental Health (NCT01726387) implements and evaluates a complex, low-threshold, nurse-led intervention using a goal-oriented set of case management and counseling techniques to promote self-management in these patients. This paper investigates the association of the patients’ motivation for change and their perceived self-efficacy, the primary outcome – to get to know whether the intervention will target the appropriate population.